As I wrote last time, the “f‘s” were drawn on the exterior of each instrument’s sound board (or front) before the spessori work began. Once the majority of the wood has been carved out, Yonatan cuts them out (well, right now only those of the cello have been completed, and those of the viola will be in just a couple of days). I asked Yonatan to explain the sound-holes to me and he said that, as in many components of the violin family, the sound-holes have both a functional aspect and an esthetic one. Functionally, they are located on both sides of the bridge, in the narrowest section of the sound-board, where the arch is the steepest. This is the area that needs to be flexible enough to vibrate, but at the same time strong enough to carry the tension of the strings. So cutting open the f-holes is what creates the necessary flexibility, allowing the sound-board to vibrate better. Esthetically, apparently they were not always “f” shaped, but started out actually as two “c‘s”….. By now, though, it’s become tradition that they are “f” shaped, although there are numerous variations on the exact shape – some make them straight, others make them leaning to one side; some make the “heads” of the “f” round (Stradivari-style), and others make them elliptical (Guarneri-style); and so forth. 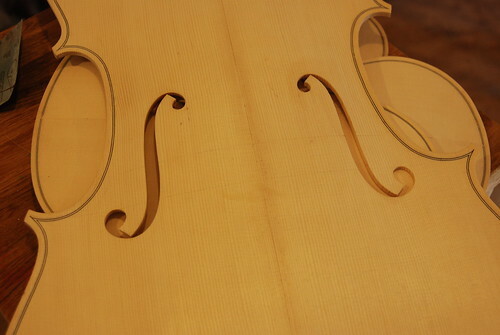 As was the case with a few prior phases of this work, the sound-holes are a place where the artisanship and personal touch of each violin maker come into play. Apparently, if you know the trade, you can recognize the “signature” of famous violin makers, just by the shape of their “f‘s” (!!) And also, as was the case a few times before, this is a phase that requires special artistic and technical skills (what the Italians call “manualità“, with the accent on the last “a”). Of course that’s why Yoantan likes it…. So in line with his choice to build the Quartet based on his own models, Yonatan designed the sound-holes in a way that would be the same throughout the Quartet, but would also work well with each of the different instruments. 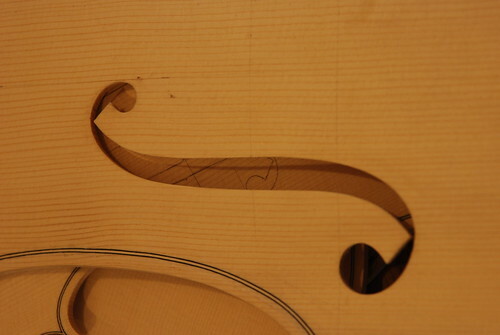 As he explained it to me, he likes making the sound holes “a little more oval-shaped than those of Stradivari, but a little less than those of Guarneri”. This is the kind of minute-details I guess I will never be able to see… but whatever makes him happy! Unfortunately, at the moment the house looks like a real dump. No windows. No doors. No floors. And in part no roof. If I though four more months to finishing the Quartet is a tight schedule, how about 6 WEEKS to turn this construction site into a livable home?!?! Why six? Because in eight weeks the rental on the house we currently live in ends, and the new house had better be ready for us to move in with all our stuff, three kids, a dog and the fish aquarium. But – as with the Quartet project, we remain optimistic! How about you? Want to place your bets?